Tonight Spencer and Griffin with others from Kids for Democracy were greeters for the NH 100 Club dinner in Manchester. 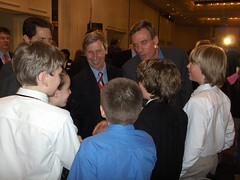 Before dinner they lead the Pledge of Allegiance and met with former VA governor Mark Warner and NH governor John Lynch. See the complete set of photos from the event. Kids for Democracy? Really, what is the age range for joining? That is too cool!